The Deep Fried Mars Bar was invented in Stonehaven, Aberdeenshire, Scotland by the chippie, or chipper as we say in Grampian, Carron Fish and Chip Shop at Allardice Street in 1995. In 2007 it was named as the 10th most unhealthy food ever. Other foods thought to be bad for the health included Spam, Cheesesteak and quiche. This hasn't stopped many regulars at the Carron Fish and Chip Shop from ordering their favourite snack. The owner, John Wilson, still sells about 100 deep fried mars bars each week. Variations have appeared throughout Scotland and the UK. 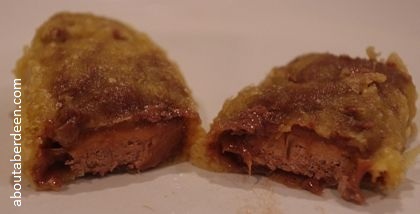 Examples are deep fried snickers bars and deep fried creme eggs at Easter time. In December 2004 the doctor's magazine The Lancet published a study by Glasgow doctors Dr David Morrison and Doctor Mark Petticrew into the phenomenon of the deep fried mars bar and found that 22% of chip shops in Scotland sold them. Three quarters were sold to children whilst fifteen percent were sold to adolescents. The average price was 60 pence. An easy deep fried mars bar recipe that you can try at home, though it really is not good for your health, is to beat a raw egg. Dip the mars bar chocolate into the egg and ensure all of it gets covered in egg. Then put this into a batter mix and deep fry until the batter turns golden. In parts of Scotland you can also get deep fried ice cream or creme eggs. Gordon Ramsay treated his guest, Edith Bowman, on his channel 4 programme The F Word to one on Tuesday 1 July 2008. Whilst a pregnant Edith Bowman, the radio 1 DJ and presenter, happily munched her slice Gordon Ramsay spat his into a bin. They then went head to head with a cook off where Edith Bowman cooked haggis neeps and tatties whilst Gordon Ramsey made a hash brown with haggis. Edith Bowman won 5 to 0. Since writing this article we have heard from a Glaswegian reader who grew up in the Hillington area of Glasgow and recalls that all the chip shops locally sold battered mars bars during the 1970's.